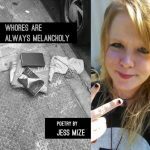 In Whores are Always Melancholy, by Jess Mize, published by Finishing Line Press, what starts off as a narrative with a haunting, gritty film-noir feel soon becomes something more contemporary and sinister. The book begins with descriptions from a ghost-like narrator, who travels around the world and describes everything they see. They allude to jazz clubs, and absinthe, and precious jewels. However, the narrator soon seems to transition into somebody living in a different world, or a different time—someone who’s in love, but is hurting over it. This narrator describes sitting in cars with a lover, and the music of Lana Del Rey, and Rihanna’s iconic Swarovski Crystal gown. Soon, readers also realize that all of these details are also mixed in with the details of something more horror movie-esque, and it only goes from there. This book is incredibly vivid in its telling (or retelling). The imagery is so incredibly rich, but don’t believe it’s all just for an aesthetic: Jess Mize creates a complete world with these poems. It’s a world that’s incredibly visual, but you can also hear it, and feel it. The emotions in Whores are Always Melancholy have many dimensions, some of which are more difficult to interpret than others. Nevertheless, in a time where most everybody’s hooked on nostalgia and details, these poems are sure to strike a chord anywhere. They are confessional in the most unique way. They do not sit easily with you, but they will stick with you, even when you least expect them to. Whores Are Always Melancholy is available now from Finishing Line Press. Lydia Havens is a poet and editor currently living in Boise, Idaho. Her work has previously been published or is forthcoming in Winter Tangerine, Cosmonauts Avenue, and Black Napkin Press, among others. Her first full-length collection, Survive Like the Water, was published by Rising Phoenix Press in February 2017. You can find out more about Lydia at www.lydiahavens.com.